If you missed #27 click here. Best Moment: Customising cars and logos, at the time I'd never seen it done in such detail! "Racers, start your engines, and let's get it on!" Maybe I'm bigging this game up too much but for me, this was one of the first PS1 games I had ever seen. 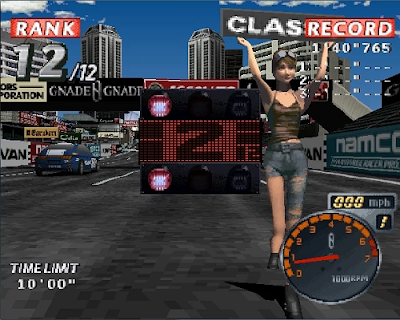 I never played the Ridge Racer games, but this spinoff game in the series was the first time I'd seen a racing game done with such incredible graphics at the time. I love the female in the game (I don't know her name), doing her commentary and holding up the cards between races. I loved the car modifications you could do, and specifically the fact that you could create your own logos. 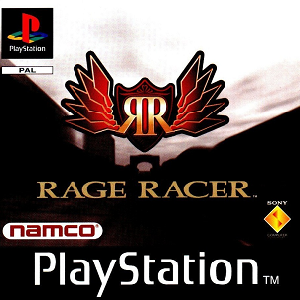 At the time it was just simply bigger and better than any racer that I'd ever seen, and it'll always hold a strong place in my heart, being one of the first, if not even the first ever PS1 game I saw. Want to find out what came in at #25? Click here!